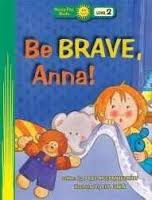 Anna learns to trust God’s strength when she’s scared: “The Lord is my helper, so I will not be afraid” (Hebrews 13:6). Colourful illustrations and simple text.Explore Faith That Sticks books--filled with fun-to-read stories and activities that teach children about God while they are learning to read. Faith That Sticks books include stickers, discussion questions, and other activities designed to bring enjoyment and deepened learning experiences for kids.